So, last month I finally got my new work system. It is a nice Dell Precision M4500 running an Intel Core i5, 8GB RAM, tons of Hard Drive space, etc. I also made the move to Windows 7 X64 from Windows Vista. In reality, I don’t use many of the super advanced OS features. I wants the OS to “stay out of the way” of my day to day tasks. One of those tasks is remoting into servers and headless desktops. It is not that unusual for me to have several Remote Desktop(MSTSC.exe) windows open at the same time. Now, I will usually fire up the remote desktop windows in fullscreen mode and take care of some tasks. Once complete, I will minimize the window, like any other window. The problem appears when I restore the Remote Desktop window. Instead of returning to true fullscreen, I find that the Windows 7 Taskbar, or Superbar, blocked the window from returning to full screen. Also, the remote desktop window now has scroll bars. Luckily, the fix is pretty easy. We all know we can use Ctrl-Alt-End to send a Ctrl-Alt-Del message to the remote desktop. 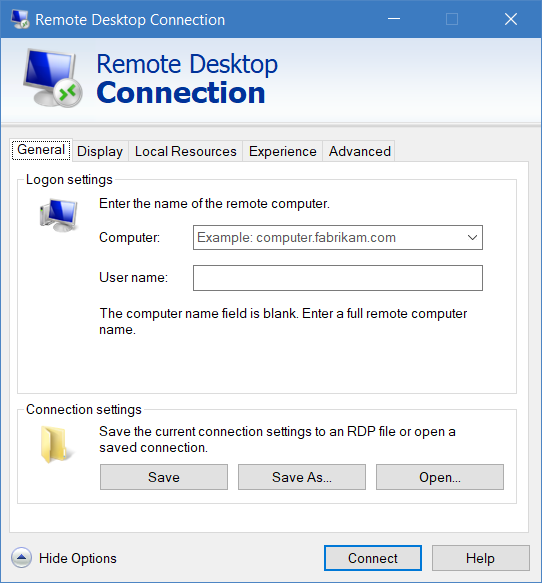 Similarly, we can use Ctrl-Alt-Break to force the Remote Desktop window to a true full screen. Superbar or not, the Remote Desktop is now full screen again!